A man in Dallas, Texas is facing charges after explicitly stating (by filing papers in a federal court) that he will use deadly force to stop an abortion. In the filing, he asked for a restraining order against law enforcement, asking that “officers not be allowed to harm him if he had to harm someone else.” He went so far as to name the specific clinic along with the date and the time when he would pay his visit. Erlyndon Joseph “Joey” Lo, 27, of Plano, filed documents there Friday saying his religious beliefs entitled him to use deadly force to prevent an abortion. He listed the name of a clinic, its address and the time he was going to show up â€” noon that day. “I plan on saving at least one human life in Dallas, Texas,” Lo wrote. Fortunately, the FBI takes these kinds of threats pretty seriously, especially one that includes such detailed specifics, and Lo is now facing two charges, one for using interstate commerce to communicate a threat to injure and another for threatening force to “intimidate and interfere” with clients and employees of a reproductive health clinic. Twenty-seven year old Lo, a Southern Methodist University law school graduate who lives with his parents, is serving as his own attorney, which may explain the absurd nature of the class-action lawsuit that he’s filing, seeking “more than $999 trillion in damages.” He’s also asking the court to pay him $1,000 per hour in attorney fees. He has also filed suit against the U.S. Supreme Court in an attempt to outlaw abortion. Like almost all abortion rights opponents, Lo’s stance is based on religious belief. He says he has been a Christian since he was in fourth grade. 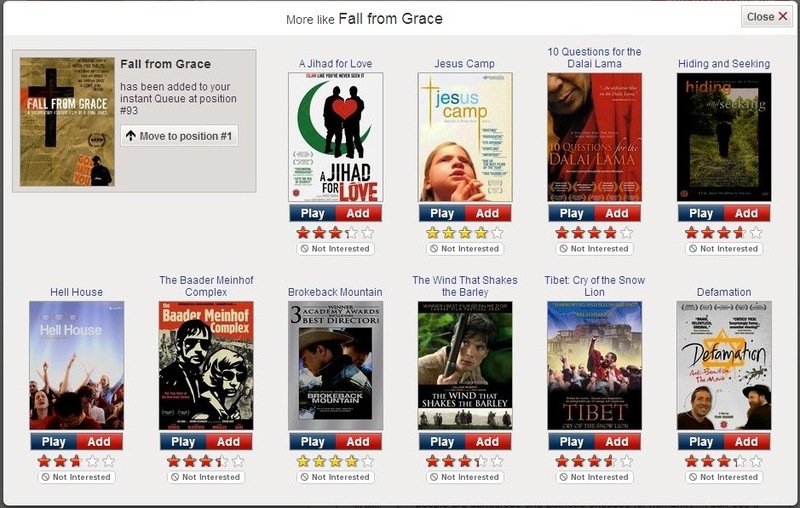 “I accepted Christ into my life when watching TV. Some guys were really strong and breaking ice. They invited me to accept Jesus into my life and ask him to forgive me for the ways I sinned. I did so, and I was changed,” according to his site. “My religious beliefs include the beliefs that an individual is alive at the moment of conception, abortion is murder and is the worst murder of all murders possible because these babies are completely defenseless, and I am entitled under my religious beliefs to use deadly force if necessary to save the innocent life of another,” Lo wrote. Where Lo differs (outwardly, anyway) from many others who oppose abortion rights is in his belief that he is entitled to use deadly force. Whether he thinks this makes him a sort of “holy warrior” is unclear, but what is clear is that religious belief is the root cause of his self-righteous, extremist stance. Not rational thinking, not reasoned morality, not scientific fact, not biology… religion. This isn’t some radical form of Islam, either. Lo is Catholic. Not only is he Catholic, but he considers himself a “good Catholic.” There are, of course, those who will say that he’s not a “real” Catholic, but for every person who says that, there are plenty more who will make identical counter claims. It’s the “No True Scotsman” fallacy and doesn’t hold water. He’s a true Catholic… a true Christian… as much as any other Catholic Christian. Obviously he holds some varying beliefs from some other Christians, but that doesn’t make him less of one. Religion encourages fuzzy thinking and superstition. 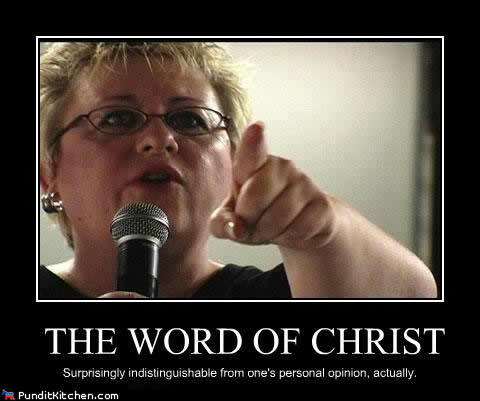 It encourages unquestioning acceptance without supporting evidence. It encourages blind obedience in (questionable) authority. It encourages a self-righteous, unwavering belief that it, alone, reveals truth, defines morality, and creates meaning. 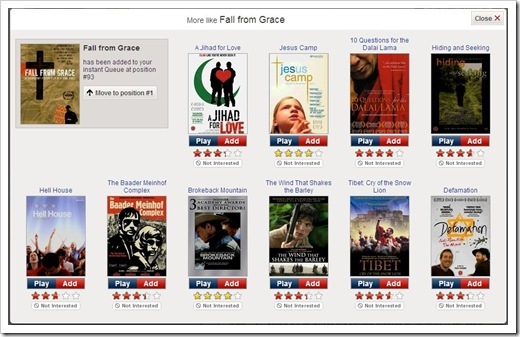 It creates a self-perpetuating fantasy world… where people like Joseph Lo thrive. The Onion generally has great satire and this piece about the Sumerians looking on in confusion as the Christian god creates the world is no exception. It’s simply brilliant! Members of the earth’s earliest known civilization, the Sumerians, looked on in shock and confusion some 6,000 years ago as God, the Lord Almighty, created Heaven and Earth. According to recently excavated clay tablets inscribed with cuneiform script, thousands of Sumeriansâ€”the first humans to establish systems of writing, agriculture, and governmentâ€”were working on their sophisticated irrigation systems when the Father of All Creation reached down from the ether and blew the divine spirit of life into their thriving civilization. From there, it just gets better. According to the cuneiform tablets, Sumerians found God’s most puzzling act to be the creation from dust of the first two human beings. It’s amazing how well-written satire can so dramatically (and clearly) point out the silliness of the young Earth creationist mindset. I’m sure the Sumerians would have agreed. 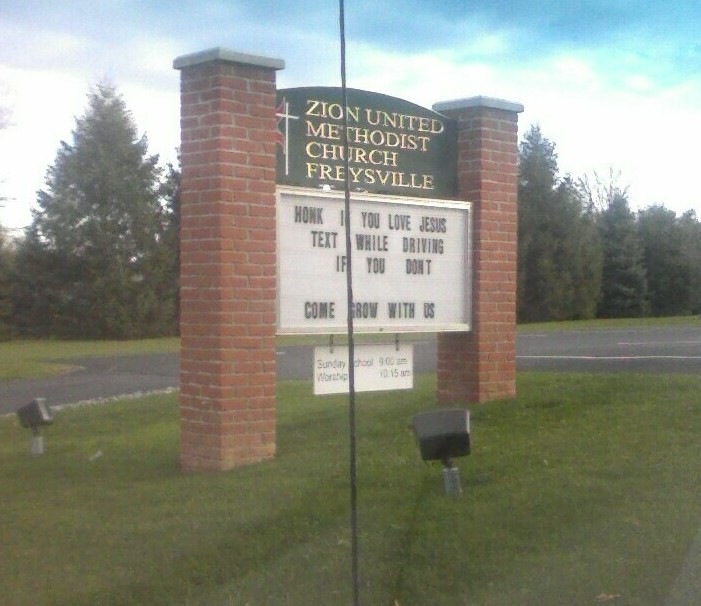 The church sign I saw today at a local church currently ranks as the worst one I’ve ever personally seen. When I read it on the way to work this morning, I almost pulled over right away to write it down (I waited for a stop sign instead). Here’s what it said. Text while driving if you don’t. My initial impression was that I was just misinterpreting it… because all I could get out of it was “Honk if you love Jesus, otherwise crash and die.” I showed it to a religious friend at work and his jaw fell. He couldn’t think of any “good” interpretation of that message, either. Another friend told me that he’d seen a sign that said, “Honk if you love Jesus. Text if you want to meet him.” That’s still kind of morbid, but it’s more of a traffic safety message than a good Christian message. Perhaps the sign I saw was a gross misrepresentation of that one? I’m still not going to text while driving. I snapped a picture of the sign this morning using my cell phone. The image is a bit grainy and I managed to get my car’s antenna right in the middle of the sign, but the words are legible. Click for a bigger version. Enjoy! I’m going to assume that someone put it up there without understanding what the words imply. 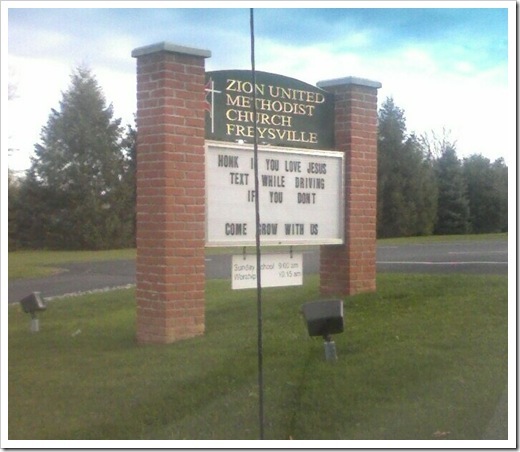 I doubt there’s someone at that church who is vindictive and spiteful enough to wish death on the non-Jesus-lovers. I could be wrong, but I’ll give them the benefit of the doubt. 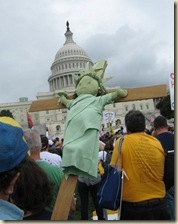 From Bay of Fundie comes a slideshow of some of the signs from this past weekend’s “tea party” protest in Washington, DC. I’ve seen a lot of pictures from the event and have even seen a number of signs I do agree with (mostly related to bailouts and government spending), but the number of signs that portray true ignorance is just too great to ignore. As I posted on my personal blog, protests are more about signs with clever slogans than addressing issues in any detail, but when those signs comprise an incoherent, inconsistent, scattershot collection of complaints with an underlying ignorance of the associated issues, there’s nothing productive about it. In this slideshow, there are accusations of death panels, mandated abortions, liberal fascism, and communism. 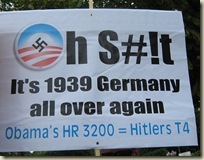 There are comparisons of Obama to Hitler, Lenin, Stalin, and Castro. There are complaints about Planned Parenthood, health care, ACORN, child trafficking in prostitation [sic], smallpox vaccinations (!!! ), and the word “czar.” Even the tired old “Where’s the birth certificate?” nonsense is rolled out for show and tell. In other pictures, I’ve seen signs stating that the US is a Christian nation, that we’re “One Nation Under God,” that we need to pray more, and that Obama is a liar. There are plenty of other signs, but along with those signs come some interviews of some of the folks carrying them. I will grant that the interviews are a small sample and may not be indicative of the ignorance level of the crowd in general, but based on the crazy signs I’ve seen, the interviews may not be too far off base. What’s the common thread that runs through all the carriers of the more outrageous signs? Is it racism? Fundamentalist religion? Lack of education? Partisan hatred? I don’t really know, but I can make an educated guess at some of the causes. All of the above, perhaps? The candle flames of racism, ignorance, and religious fundamentalism get fanned and fed by outrageous, hate-filled talk by the likes of Glenn Beck, Sean Hannity, Rush Limbaugh, Bill O’Reilly, Ann Coulter, and other right-wing talking heads. These commentators help create and instill irrational fear in these protestors with spin, exaggerations, lies, and incendiary rhetoric. What’s worse is that the right-wing politicians do the same… assisted by fundamentalist preachers… assisted by conspiracy-theory proponents. While some of the protesters had serious signs that indicated rational policy disagreements, a huge number (perhaps a majority) of the signs were simply banners of ignorance… spiteful displays of unfocused rage. In some of the interviews, protesters couldn’t explain what their signs meant or why they held the positions they did. They were just there to vent their nebulous, right-wing, Glenn-Beck-inspired rage to the Washington, DC mall and to be surrounded by others who were just as rage-filled. We can do that in the United States. Our Constitutional First Amendment guarantees us that right, which is a beautiful thing. It’s one of the things that’s great about our country. When I see people like this taking advantage of that right, especially in a relatively well-mannered and orderly way, it makes me proud of our Constitution. …but it makes embarrassed about our citizens.